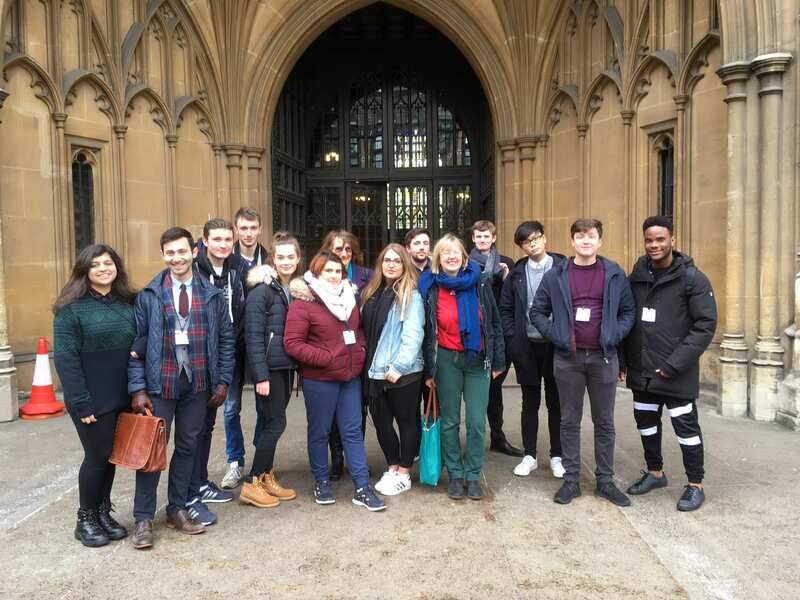 On Tuesday 27 February, Sara Birch and Lucy Jones travelled to London with some of th eir first year Public Law students to visit Parliament and the Supreme Court. We had been invited to go on guided tours of the House of Commons and the House of Lords by Lord Bassam (a Brighton resident) formally the Deputy Speaker in the House of Lords but now working as a backbencher. Paul, an experienced Parliamentary guide, showed us round Parliament giving some fascinating detail of the history and architecture of the House. We were lucky that the Commons were sitting in the morning and we were able to go into the Public gallery to watch MPs in action debate over a mental health issue. Lord Bassam, later invited us to his office where he gave a short talk on his work in the Lords and answered our many questions. It was a wonderful opportunity for the students to see and hear about the workings or Parliament first-hand and to be able to question Lord Bassam personally on past and current issues of parliamentary debate – such as, for example, whether the House of Lords should be reformed. the police have a positive duty under Article 3 European Convention of Human Rights to conduct investigations into allegations of ill-treatment. This judgement will have a substantial impact on the way police prioritise and allocate resources when investigating reported crimes. We are very grateful to Lord Bassam, his staff members and the staff at the Supreme Court for their hospitality and engagement with us and we hope to repeat the tour at least once for law students at the university in the next academic year.